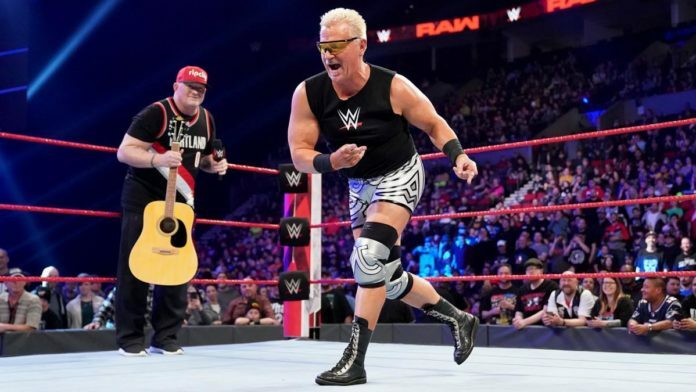 WWE Hall of Famer Jeff Jarrett made a surprise appearance at the recent ICW Square Go event. The Scottish based company held the event at SWG3, Glasgow on Sunday 24th. The main event would be the annual Square Go! bout. A rumble styled bout with weapons. Kay Lee Ray would also be taking on NXT UK Women’s Champion Toni Storm. Jarrett appeared during the Square Go! match. The former TNA World Champion appeared at number 29 in the bout in a complete surprise to the crowd. Jarrett appeared recently for the company as part of the Fear & Loathing event in the SSE Arena, Glasgow. The Square Go was eventually won by Rudo Lightning, who eliminated Joe Hendry last. Lightning becomes the first performer to win two Square Go bouts, he won the inaugural contest back in 2012. Rudo entered the Royal Rumble styled match at number two. Along with Liam Thomson, who entered in the first spot, lasted over an hour. Some high profile competitors in the bout included NXT UK Superstar Wolfgang and a returning former ICW World Champion, ‘Just Justice’ Jackie Polo.